Following a recent spate of SPAM “Request a copy” requests being sent out by a SPAM Robot using the STORRE “Request a copy” form (the form that STORRE users can use to request a copy of embargoed items in STORRE directly from the author), we have now added a Captcha to the form which must be completed before it can be submitted. 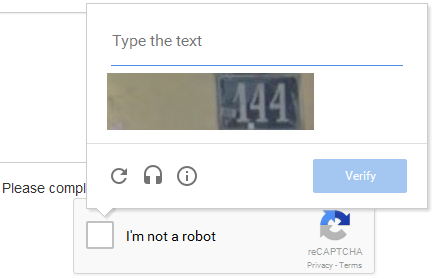 A Captcha (which is an acronym for “Completely Automated Public Turing test to tell Computers and Humans Apart”!) is a simple challenge-response test designed to determine whether or not the user submitting the form is a human or a machine, and should prevent the form from being submitted by an automated robot. Captchas generally use some form of distorted text that the user has to decode before they are allowed to pass, but they have come in for criticism as they can sometimes be hard to solve. In order to simplify the Captcha process as much as possible, the Captcha system we have implemented is Google’s “reCAPTCHA” which uses an advance risk analysis engine to tell humans and bots apart. With reCAPTCHA, in many cases a valid human user will pass the reCAPTCHA challenge without even having to solve a Captcha! If you have trouble reading the text in the Captcha, you can request new Captcha text, or an “audio Captcha”, using the icons that appear in the bottom left of the Captcha popup. Hopefully this new development will stop the flow of SPAM “Request a copy” requests that Stirling authors have been receiving without inconveniencing legitimate end users too much.